Every month I look forward to receiving my BNT Beauty Box because of the amazing products that it contains. Of course there are some duds but most are surprisingly awesome. This month's box is packed with exciting new products from brands that have recently joined the BNTGirls Project. The first product that caught my eye is this Faith in Face Truly Waterly Cleanser. It's pink, blue and white packaging is so captivating that I immediately wanted to try it out. Before heading on to the actual review of the product, here's a small background about the brand. Faith in Face's catchphrase is "Have Faith in Face, Origin in Beauty," which stems from the belief that each person has a certain unique beauty and that the role of cosmetics is to help reveal and bring to light each individual's hidden beauty and with the help of their products, make the person be more confident. As I mentioned above, the packaging for this product is so fun and beautiful that it is definitely eye-catching. It reminds me so much of brands like Soap & Glory and Benefit Cosmetics which also packages their products with colorful and fun, vintage-retro inspired vibe. It is fairly easy to use this product. 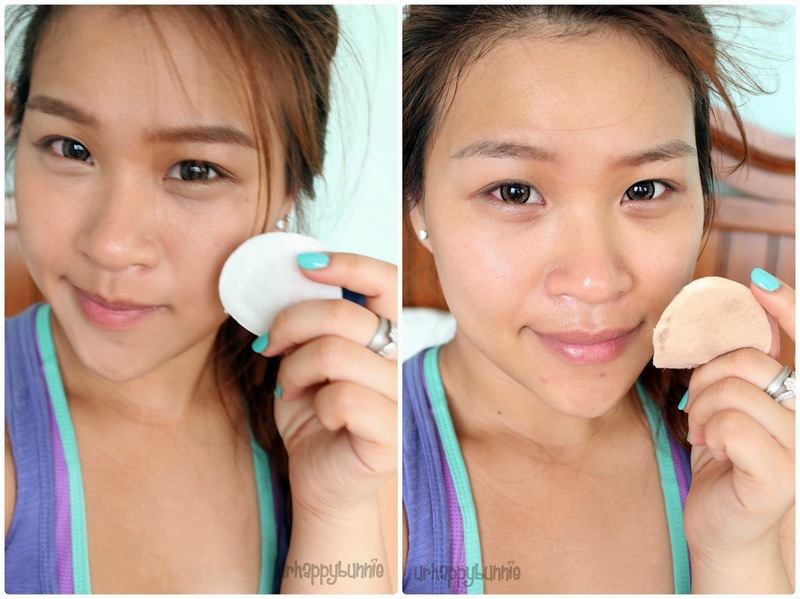 Just soak a cotton pad with the water and gently wipe the face to remove the makeup. For areas with stubborn makeup like the eyes, leave on for 10-15 seconds before wiping off. This product can also be used as a toner. For the past year or so, there has been a lot of hype on cleansing waters that removes practically removes all makeup and hydrates your face, something that I wasn't really interested in since I like washing my face at night with a cleanser and water. I honestly didn't see the point and benefit of just using a cleansing water to remove all makeup and just slide right into bed after. Probably the most hyped up cleansing water product is the Bioderma Sensibio H2O. It comes in a similar bottle as the Truly Waterly with its pink bottle cap though it looks more clinical as opposed to Truly Waterly's fun and bold look. With the packaging beckoning me to try it out, I tried a cleansing water for the first time and I finally see what the hype was all about. The Faith in Face Truly Waterly removes all makeup - everything! I was really surprised how easy it was for a mere water to remove my toughest waterproof mascara. I would usually have mascara residue even after washing my face but this took off everything. This product is unscented which is great for those who have sensitive noses. Most makeup removers have a slight alcohol smell to it but this one doesn't. It's just water. One of the phrases written on the box says, "Love me tender, love me true; water for cleansing, not for drinking." This is definitely true! With a full face of makeup on, it took me about 4 cotton rounds to remove all of my makeup. Not bad when comparing it to a makeup wipe which has a bigger surface area than a cotton round. Once all the makeup is removed, my skin felt soft and moist. Usually, after using a cleansing wipe or regular makeup remover the skin feels dry but this one doesn't do that at all. My skin felt fresh and clean. I just spritz on my usual toner after makeup removal. To be honest, I still prefer washing my face after makeup removal but the cleansing water is perfect on those tiresome nights where you just don't want to be bothered by a long-winded night time routine. You can just use Truly Waterly and go right into bed skipping all the other steps since this product is also moisturizing. On the left is a photo of me with a light makeup on - foundation, concealer and brow powder. On the right is the after photo. As you can see on the right, my face is clean and looks slightly dewy because of the moisture it leaves on the skin. Above is a before and after photo of the back of my hand with other makeup products. Since I did the demo on my face with light makeup on, I needed to show you how wonderfully it worked in removing my strongest waterproof mascara and waterproof eyeliner. Also, it removed all traces of the red lipstick which usually is hard to remove. For a 300ml bottle, the Faith in Face Truly Waterly Cleansing Water's suggested retail price is $14. Since it is not available for purchase from FIF's official website, you can find this product on YesStyle, eBay and other online shops although it retails from around $17-$22. I do recommend this product if you can get your hands on this for $14. With that price, it beats having to purchase other cleansing waters that are usually 250ml in size that retails for $23 and up.